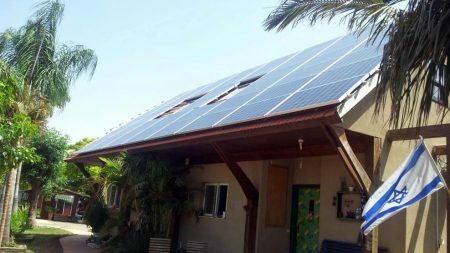 The Solar Energy System At Kibbutz Hafetz Haim is one of the first Medium Size systems designed in Israel. The system which generates green electricity was installed on cowsheds roofs, with an installed capacity of 500 KilloWatts. 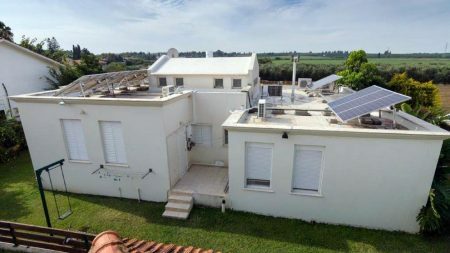 The solar system was built by Inbar Solar Energy in collaboration with the Spanish company 9REN. The PV system includes 2,127 panels by Trina with an output of 235 watts each and 39 inverters made by PowerOne. The solar energy system was connected to the power grid and began producing green electricity in March 2013. The system is installed on top of 10 different roof segments, with different slops and orientations, and in order to maximize its power output was designed so that all panels are optimally positioned . 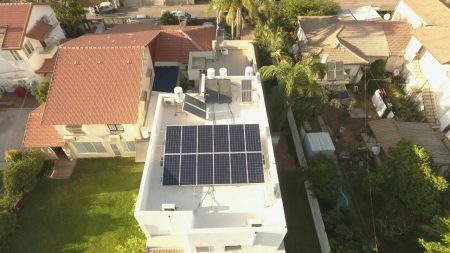 This solar energy system served as a model to many Israeli solar energy systems that followed.